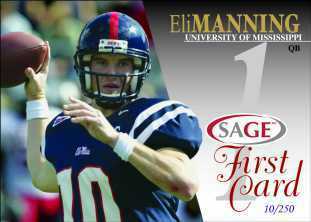 Two years ago SAGE Collectibles, Inc. produced the first-ever trading card product to be in stores prior to the amateur football draft. HIT 2004 Football will surpass even that mark shipping the very first week of April, well before the April 24-25th draft. HIT is jam-packed with superstar players in one of the draft's heaviest offensive skill position drafts in memory. Among the notable players are Eli Manning, Maurice Clarett, Ben Roethlisberger, Philip Rivers, Kevin Jones, & Roy Williams, all of which are contracted to provide authentic autographs & jersey cards. Not only are those great players being featured in the earliest football release ever of the next great football stars, but HIT 2004 Football also features an amazing average of 5 authentic autographs & 1 authentic jersey card per box! "As soon as we shipped out information on HIT 2004 Football, our phones have been ringing off the hook," said Tom Geideman, president of SAGE Collectibles. "The fantastic player selection, tremendous insertion rates of autographed & jersey cards, and very early ship date is a never-before-seen combination." HIT 2004 Football also brings back the hugely popular The Write Stuff insert featuring innovative hand-writing analysis to give a unique insight into the top players. A super-rare autographed version of the insert is also randomly inserted, with each card sequentially #'d to only 25. Premium Swatch Jersey Cards are also back & sequentially #'d to only 50. Product quantities are as always, very limited, & yet another pre-shipment sell-out is expected. Therefore pre-orders with your favorite hobby shop or Authorized SAGE Distributor are highly recommended.